Residents of Beverly Glen, Inc. has been tracking the progress of this project closely and through its attendance of meetings at the Bel Air Beverly Crest Neighborhood Council. RoBG has requested the applicant of this project to come to the Les and Dorothy River Community Center to provide residents a chance to see the project, ask questions, voice support or opposition and get informed. 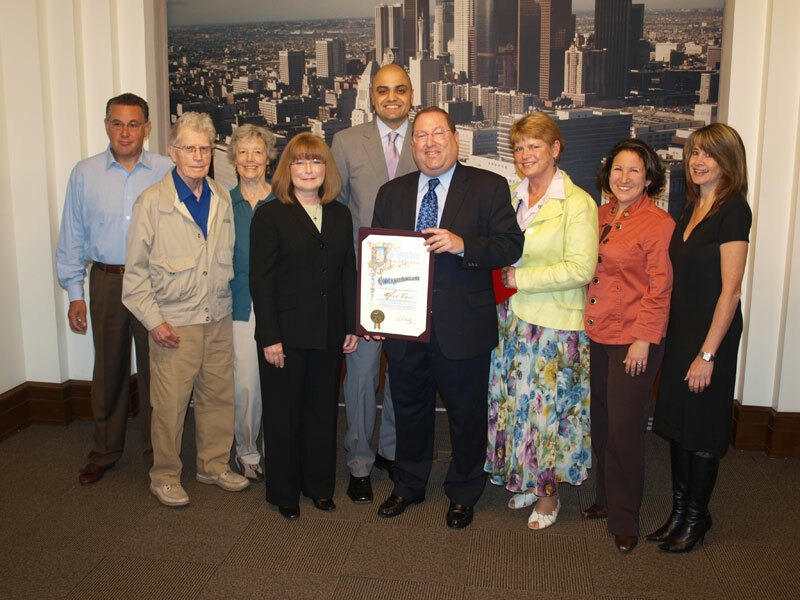 Thanks to our Councilman, Paul Koretz, and his hard working field deputy Jeff Ebenstein, Residents of Beverly Glen, Inc. was honored in City Hall on Friday, June 25, 2010 during an official session of city council for 50 years of Glen Fair and separately, our Fair co-founder, Chris Holabird. Councilman Koretz was generous in the kind words about Residents of Beverly Glen, the Glen Fair and you, the residents! We were even featured in the Councilman’s newsletter, Hi-5, if your not subscribed already, sign up, a very valuable tool to stay in touch with your Councilman. Friendly reminder, Fair is tomorrow 12-5pm, don’t miss the traditional parade at noon. Parking is best on Beverly Glen then walking up or just walking from you’re house! Bring family, friends, neighbors and yourself! Hot off the presses, the official 50th Annual Glen Fair Program is available online. We have got a full program special for our Golden Anniversary Fair, if you’ve never been to the Glen Fair, don’t miss this one, if your thinking of only coming for a little, you’ll miss alot. The Fair Committee and Beverly Glen Playgroup have a loaded program with music, food, wine, kids activities, two raffles, exhibits, fire truck, slides, petting zoo and special guests, your Councilman Paul Koretz and your County Supervisor Zev Yaroslavsky as well as the fine men and women of LAPD and LAFD. If interested in helping out, any help is helpful! Please email fair@beverlyglen.org. Our fearless firefighters who keep us safe at Sunset and Beverly Glen are hosting a fundraiser pancake breakfast this Sunday, 8am-11am, to help renovate their kitchen. They work so hard to keep us safe in fire season, drop by, have some breakfast with the family or a quick pancake for yourself or just come by and say thanks and leave a little something. Friendly reminder, don’t forget to vote today, 7am-8pm, check your voter information packet for location but most likely at the Les and Dorothy River Community Center, 10409 Scenario Lane, just off Beverly Glen Place (behind former Four Oaks restaurant). Its your right, its your responsibility and you get a free sticker! This Sunday is our Residence of Beverly Glen 50th Fair! Look for the Emergency Preparedness Booth, there will be important pamphlets and friendly chatter on how to get and stay ready for the unexpected. Does your block have a E-pod? What is an E-pod? Stop by and get the info! Bring your Fire Extinguisher for a $5.00 reduction off the regular price from Mike Green Fire Protection. The 50th Annual Glen Fair is rapidly approaching, on Sunday, June 13th we will be celebrating our Golden Anniversary and we hope everyone can attend. Starting at noon and running into the early evening, we will have LAFD, LAPD, Beverly Glen Playgroup and lots of activities for the kids and adult kids and a special guess, Councilmember Paul Koretz will be attending and possibly presenting a special surprise for Residents of Beverly Glen. In an effort to add to their fund raising efforts, Playgroup will be selling a variety of gift cards (Gap, Jamba Juice, Starbucks, Whole Foods, Restoration Hardware).at the upcoming Glen Fair. For those interested, the cards need to be purchased with cash and make excellent holiday or birthday gifts!! Let’s not forget our local artists and vendors, if you are a local artist or vendor and would like to exhibit at the Glen Fair in front of 200+ residents, please contact Marydee at mdgibbons@msn.com. Its a mere $35 for a space for non-members and FREE for members (another great reason to join). As we know, alot of work goes into the Fair and every bit helps so if you can give us an hour or a day, it all helps and you’ll be richly rewarded with appreciation, a pat on the back and maybe a hug or two. If interested, please contact fair@beverlyglen.org. VOLUNTEER, ENGAGE, BE PART OF YOUR COMMUNITY!